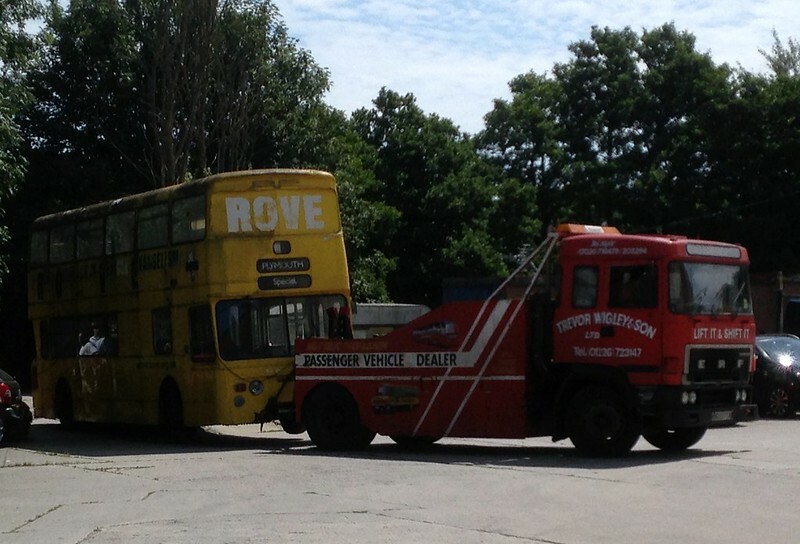 Double Decker returns to Plymouth after 26 year absence. 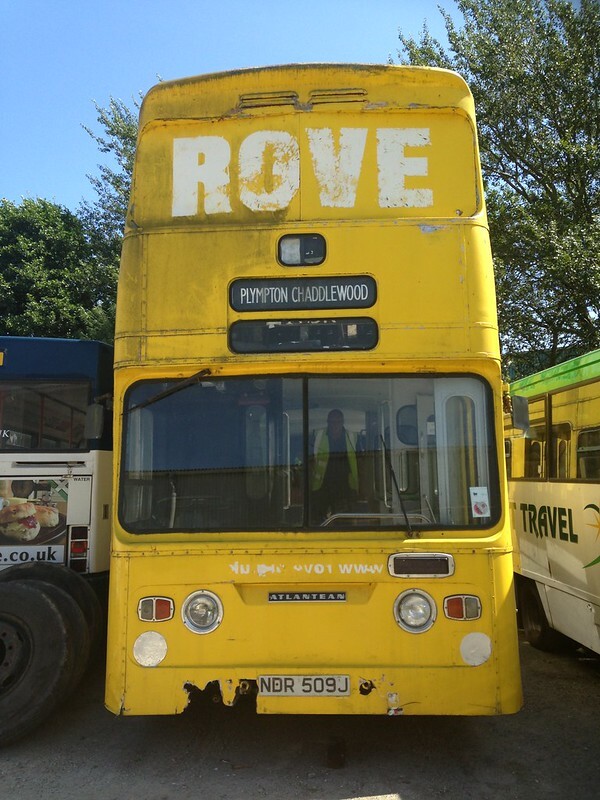 A RARE double decker bus that once graced the streets of Plymouth has finally returned home after an absence of more than 26 years in to the care of the Plymouth City Transport Preservation Group (PCTPG). No. 9 NDR 509J has spent much of the last quarter of a century in the Avon and Gloucestershire areas finally making its return visit under tow to the groups Colebrook depot in the Plympton area of the city on Thursday afternoon. The bus was one of a batch of 15 33ft long dual door Park Royal double decker’s delivered new to Plymouth City Transport in 1971. They made up the final batch of this double decker type the first being delivered in 1969 after exhibition at the 1968 commercial motor show in Earl’s court. In total the City Transport department took 58 of this type of double decker and 9 is thought to be the last of its type anywhere on the mainland UK.Over the coming months the bus which is mechanically sound and was last used as church meeting place in Gloucestershire will be worked on by members of the group to bring her back to her former glory. The restoration process will take some time as internally she is devoid of seats and other fixtures and fittings so it may not be until 2015 that she makes a return to the preservation scene. Leyland Atlantean PDR2/1 with Park Royal dual door jumbo 33ft long body. No.9 NDR 509J New to Plymouth City Transport in 1971 and withdrawn in October 1986. Acquired from the Gloucestershire church group in early 2013 and returned to Plymouth Group Member David Jenkins has worked on the vehicle since its acquisition in order for its return to Plymouth to be possible. Formed in July 2006 has grown rapidly over the last 6 years to a membership of almost 100 and a collection of 22 buses all with backgrounds of service in the Plymouth area. Our preservation work is funded wholly by member’s donations and membership fees as well as our group sales bus attending events across the region. Many of the buses are owned by individual members of the group coming under the PCTPG collection. I believe I have Plymouth's first Jumbo Atlantean and the one shown at the 1969 commercial motor show at Earls Court, reg number 221 JJY221G . It made its way to Victoria, Canada as a tour bus. I should correct that last comment. 221 was definitely not the first Atlantean, as there were other Atlantean models before. I believe it was the first Atlantean PDR2/1 in Plymouth.